I've been pointing folks to the instructions in this blog, but I wanted to pare things down so that I have one blog entry, just one, that shows only how to make your spreadsheet into something you can use in mail merge letters, label mail merges, envelope mail merges, etc. First: To print labels from a list of addresses, you should put them in a spreadsheet. (You don't have to since text files, address books, and regular databases are fine for holding your data for mail merges, too. But spreadsheets are a simple approach.) Put headings across the top like Firstname, Lastname, etc. Then: To make your spreadsheet into something that your mail merge document (labels, Christmas letter, etc.) can talk to, you need to make a little database file that points to your spreadsheet. Finally: You make your mail merge document (labels, Christmas letter, etc.) and have it point to your database. That's the summary. Here are the specifics. Here's what your data should look like. The columns you use are up to you. Put in whatever data you will need. Put City, State, etc. all in different columns. Be sure to put the label at the top for what the field is: Name, etc. This is important. Here's a sample file. Right-click on the link and choose to save it to your computer. You need to make a database file that points to the spreadsheet. 8. Save the data source (aka database) under a name that will help you remember what it is. This is the name that you will see in your lists of databases. You're done with the database. To write a letter that points to the database you created, follow these instructions, steps 3 and 4. You've already done 1 and 2. To do envelopes that point to the database you created, follow these instructions. I strongly advise you NOT to use any of the mail merge wizards under the Tools menu. Far too complicated. Ag. I just spent hours figuring out how to do that yesterday. 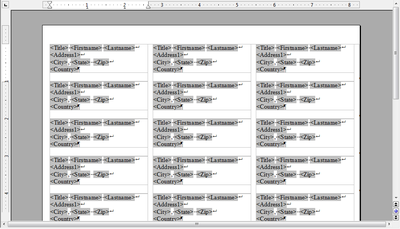 When I view the sample database on this page, it displays in non readable characters. I tried to view in several types of character encoding, including auto detect, without luck. Perhaps you know what the encoding should be so I can view and download this sample file. Try rightclicking on the database link and saving it to your hard drive, then open it in openoffice. How do you query across databases that are linked to spreadsheets? I have two different spreadsheets and I need to make a query that removes duplicates from the data in the two and displays only the unique data. A query can include two sheets (tables) in the same spreadsheet, I think, but not in two different spreadsheets. and then the second and subsequent lines need to be the data. How do you get rid of fields that have no information like Address 2, Positions, Company etc. I have blank spaces in my address labels. wow that's really great you make mailing really easy now. Pakistan that make an excellent tour.